PAD, or peripheral arterial disease as it stands for, is a type of neuropathy seen frequently in diabetics. It is said that type 2 diabetics are actually at a higher risk for developing PAD due to bodily changes that happen with diabetes. Insulin resistance puts the type 2 person at a higher risk. Arteries become clogged with fatty deposits. This leads to hardening of the arteries, and the blood vessels also narrow. The reason that this is more frequent in a type 2 diabetic is because in this type of diabetes, there is usually a higher level of fatty acids more than in type 1. But this is not to say it cannot happen in type 1 as well. As mentioned before, types of neuropathies can cause decreased feelings in the legs and feet. This will in turn, cause a person not to notice small injuries to the foot such as a cut or blisters. When you continue to walk on the injury, it is highly possible that they will worsen and get bigger, becoming infected too. If you have a combination of both PAD and also other neuropathy, it multiplies more problems because your blood flowing to the feet gets reduced. This means that your body will have a difficult time healing or fighting any infections. Wounds that are not attended to, will then get a severe infection and even lead into an ulcer. Even more can go wrong in PAD if your blood vessels which are in your heart or brain. This is what can rapidly, and without warning bring on strokes or heart attacks. Anyone living with peripheral arterial has about a 7 in 10 chance of having an amputation in the next 3-5 years. The first symptom that you may have a problem with peripheral arterial disease is pain which comes in the legs, feet, or toes. It can wake you out of sound sleep, and increase when walking. If the pain lets up when you sit down, this is referred to as claudication. Other times the feeling is described as not pain, but a heaviness, tiredness, or else cramping that occurs in the thighs, buttocks, or calves. This discomfort and pain you are feeling can make you unable to carry out activities that you do daily such as shopping in the mall, or socializing. Sometimes people experiencing peripheral arterial disease may notice that sores on the legs or feet have trouble with healing, or never heal at all. When your feet are cold a lot, this can be another telltale sign. Other signs of peripheral arterial disease may also include color changes in feet, poor nail growth, and decreased hair growth on your legs or toes. There are times that it is a possibility that PAD has no symptoms. PAD in diabetics will often go after the smaller blood vessels below the knee. And at this place on the body, there is often nothing felt that is wrong. How is this problem of peripheral arterial disease diagnosed? Your doctor will ask you a series of questions to figure out your risk, and feel for pulses in the feet, and for other sypmtoms I mentioned of above. You would probably be given a test called an ankle-brachial index test. This test is painless and not invasive. It takes around 20-30 minutes, and you will need to lay down for about 10 minutes. The laying down for 10 minutes is so that the gravity effect is the same on your arms and legs. That way the results will come out accurately. After the laying down, a doctor or nurse will measure your blood pressure numbers in your arms, and then in each foot a couple places. They'll measure it with a Doppler probe, which uses sound waves that can tell blood flow. The systolic number alone will be recorded for each area measured. They should compare the blood pressure readings in your ankles and then your arms. If it looks like it is lower in your ankles, then PAD is a strong possibility. Since the ABI is just a screening test, it does not tell you anything about where a blockage may be located. So in order to find this information out, you would probably be referred to a vascular specialist for more tests. The medical tests done would probably be an MRI, and/or angiogram to look at the way your blood is flowing. Once you find out you have peripheral arterial disease, there are some treatments available. A lot of times blood pressure drugs along with diabetes pills, and cholesterol lowering drugs will help this cause. You may also receive what is called an antiplatelet medication to cut the risk of clots developing in your blood vessels. Surgery is another option for this medical issue. Angioplasty will open up arteries leading to the heart, but it can also be done to clear arteries leading to the heart. Artery bypass is another possibility to correct this situation, as another artery is taken from another place in the body, and is reattached around the section of a blocked artery. Doctors can also do plaque removal. A small tube is inserted into whichever artery is affected . Then a tiny rotating blade will be used to take plaque from the wall of the artery. If the artery is really blocked up however, this is not usually an option. 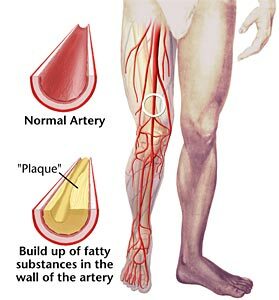 Besides keeping your blood glucose under control, cholesterol lowering is very important to avoid this problem of peripheral artery disease. Smoking does not help either, as any smoker will have a very high chance of developing this serious complication. So the best advice any doctor or medical professional will give you, is to take steps I mentioned above to keep the best artery health possible with diabetes.